I would separate the blockchain from the bitcoin. Blockchain creates an enormous chance to increase productivity in many companies and I think the technology to be something very good. But the Bitcoin and other cryptocurrencies – this is something entirely different. In my opinion, there is a gigantic speculative bubble related to the bitcoin. Because this is neither a serious method of payment nor a good way to store capital. The Bitcoin feeds on itself. There are no fundamental reasons for its price to reach such levels.... I think that more and more countries will start to make cryptocurrency exchanges illegal like China did. New regulations will be adopted. So, this will find its end. 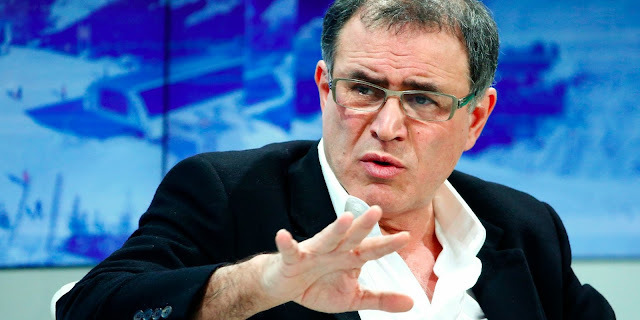 Roubini is correct here. There is no way that governments are going to allow Bitcoin to usurp government created and controlled fiat money. They will continue to add more oppressive regulations. My position in the EPJ Daily Alert on Bitcoin has been that I agree with Henry Blodgett of Business Insider that in the short-term Bitcoin could go to zero or a million dollars. It all depends on the momentum. That said, there are two big risks with Bitcoin. As Roubini identifies, one is government regulation, the other is a recession. I don't see a recession anywhere in the near future (The Austrian-lites have been way off on this, though I believe short-term that the stock market is vulnerable to a drop.) but when a recession does hit, Bitcoin is going to get whacked. Many are putting their last pennies into e-currencies, including many in Silicon Valley. If they get laid off during a recession, they may not like it but they will have to liquidate their e-currency positions to maintain their lifestyles. Since most of the e-currency buying has been straight up buying, there is little in terms of support money to absorb bids. So when the selling comes during a recession, the price is going to get hit very hard. If it’s “not a serious method of payment” then what’s the burning need to regulate it? As with everything else in the financial universe, the goal of regulation seems to be to prevent "money-laundering" (i.e., stealing from the government), which seems to be the best feature of bitcoin. By it in dollars; sell it in Swiss francs; stash the cash. China banned it but they still trade off market and the fundamentals are the same as every market, supply and demand. Bitcoin supply is actually slowly shrinking and demand has gone up. I agree with your crash analysis though. But there is also a lot of Bitcoin held internationally. I've seen flash crashes in the market that are amazing. Usually there is enough low bids on the market to keep the tokens from crashing completely, but the first real panic on the market happens it will be exciting to see what happens as people clamour to not lose everything. Korea and Japan are big traders along with China and Russia. So basically if a large war broke out over there, that would have interesting implications. Would the country's militaries target Bitcoin mining operations? What about natural disasters creating damage or energy shortages to miners? Lots of risk!